Guess another change won't matter,since this thing is getting official!486 movies left! 1 | Accept the dare by making a comment on this post or you can email me: adrian.lessegers@gmail.com. Anyone with a blog is eligible. 2 | Make an introductory post using the beautiful Anna Karina picture above explaining the project. Link all the participants of the project in the post as shown below (scroll down). 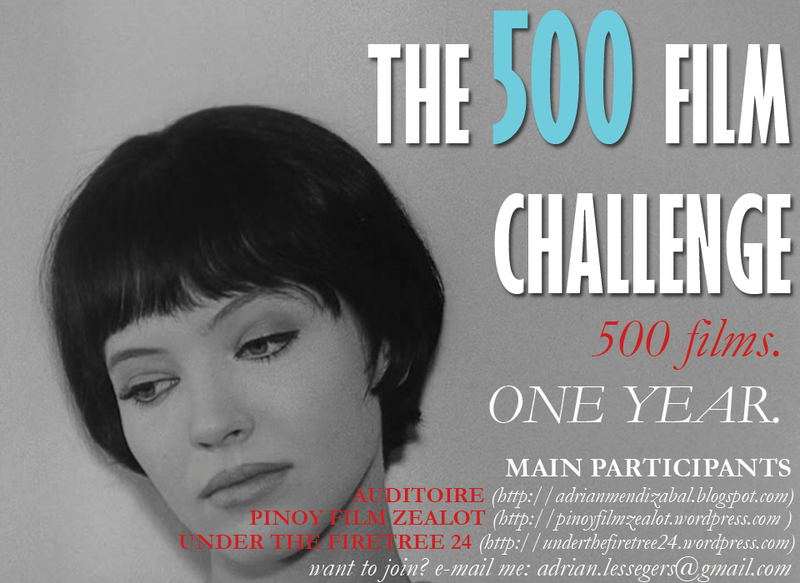 3 | Start watching 500 films and write about each one of them. Short films, feature films and extra-long films are accepted. Miniseries are allowed i.e. Carlos (2010), The Decalogue (1988) but major series are not. As long as you watched them after you accepted the dare its okay. So you cannot include films you watched before you have officially accepted the dare. 4 | You cannot repeat a film. Of course, duh! 5 | The first one to finish the project will have a special prize (to be announced before the year ends).